The first-ever DeLand Sport Aviation Showcase finished on a high note with a sold-out flock of vendors giving kudos to event director Jana Filip and her team. I spoke to most exhibitors and heard zero complaints. By itself that’s rather unusual. Perhaps they were cutting the new show some slack but more likely their enthusiasm was because the show had indeed been well executed. Attendees also seemed to enjoy themselves in the abundant sunshine and 80-degree temperatures of early November. The event ran 3-4-5 this year and has already set dates for next year with an expectation of similar weather. One thing many attendees liked was the easy access to go take a demo flight in an aircraft they might be considering to buy. Smaller events like DeLand offer a compelling case for visitors for precisely this reason. 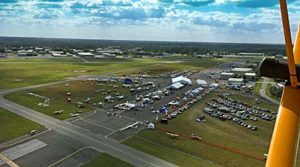 Among such focused shows, DeLand joins a group including Sebring (coming up January 25-28, 2017), Midwest LSA Expo, and Copperstate with another in planning. I judge DeLand 2016 a solid success that clearly benefitted from long experience and hard work by director Jana Filip, her husband Gary Filip, and airport manager John Eiff. Aided by a small army of volunteers the first-ever event functioned very smoothly. Most expect traffic to grow for subsequent events given how well everything worked over three straight days of pleasant weather. DeLand is near Daytona Beach and Orlando, Florida in an easily-accessed location. The airport and the new event is strongly supported by the City of DeLand with the mayor and other officials attending. DeLand is also a particularly active sky diving airport yet even with many disparate users, things ran safely and efficiently. One smart decision was to pick dates near the gigantic National Business Aircraft Association (NBAA) show that occurred November 1-2-3 at the Orange County Convention Center in Orlando. The two events could hardly be more different, but NBAA attracts all the main aviation publications. DeLand hoped to draw some of these journalists since they were in the area anyway. With visits from AOPA Pilot, General Aviation News, AVweb, Aero-News Net, Plane & Pilot, Flying magazine plus a number of free lance writers and photographers, I’d say this date decision was a resounding, over-the-top success. Look for the work of those journalists as uploaded or printed. Even though it was a tail-end-of-the-season show, DeLand attracted some products Americans had not seen before this year. 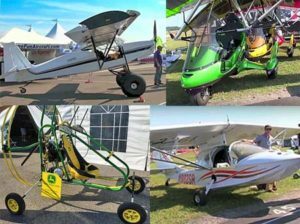 These include JMB Aircraft’s VL3 and Russia’s SP30 STOL that first debuted in the U.S. at Oshkosh 2016 plus the Sky Tractor and a novel new avionics device called WingBug. In addition, we saw the first installation anywhere of Dynon‘s new HDX. Installed in the panel of a new CTLS now produced by AeroJones Aviation, we shot a video with Kirk Kleinholz, airshow tech guru for the west coast supplier of the most popular glass screens in Light-Sport Aircraft. The new unit builds on the wonderful success of SkyView with more easily operated physical controls plus a slicker-than-ever touchscreen operation. Watch for the new video. 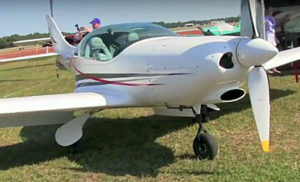 JMB Aircraft attracted attention with their retractable LSA-like aircraft. I’ve seen this company in Europe at the Aero Friedrichshafen show. They are impressive marketers and they wish to use those skills to promote their faster model that smokes along at 145 knots propelled by the 100 horsepower Rotax 912 engine. If the VL3 looks vaguely familiar to you, congratulations on your sharp eye. JMB Aircraft is the new production company of the VL3, a plane designed by Vanessa Air and produced in the past by Aveko. Truly keen readers will recognize Aveko was the builder behind the Gobosh 800XP of the earliest years of Light-Sport Aircraft. The 31.5-foot-span Aveko/Gobosh version is a fixed gear LSA model where the 27.7-foot-span retractable VL3 is allowed to perform better when registered as an Experimental Amateur Built or other experimental category. The LSA model maxes at 119 knots in max cruise where the high cruise of VL3 is 145 knots. Russia-built SP30 STOL is clearly based on Zenith’s 701/750 series although closer examination reveals a number of changes and such attributes as fully-bucked or solid rivets. A very sturdy looking machine, the example at DeLand had fat tires with chubby wheelpants that looked like they could handle fairly rough terrain yet still look at home on an airport ramp. This is a simply equipped airplane but it had a very modest price point for an all-metal aircraft. Get more specs and descriptions on their English language page on the website of Canada-based Sky Tex Alliance. The speedy sibling of the former Gobosh 800XP (see video) is this retractable JMB Aircraft VL3 capable of 145 knots. Top left, clockwise: Just Aircraft SuperSTOL, Evolution Revo, Green Eagle Sky Tractor, and Progressive Aerodyne Searey, represented by FlyTheBeach.com. Sky Tractor by Green Eagle was tucked in a corner of the indoor exhibit tent; I almost missed it. This single place Part 103-capable powered parachute entry boasts a 36-horsepower four stroke Kohler engine. It looks lighter than most powered parachute because it’s closer to a four-wheeled powered paraglider. Cleverly designed to allow reasonably easy fitting of a jump seat, Sky Tractor would then have to be approved as an Experimental Amateur Built aircraft. Sy Tractor is very modestly price barely north of $10,000 depending on options chosen. Last but by no means least was an pre-release appearance by WingBug as this new device prepares for market in 2017. Because the product is undergoing final configuration changes leading to a design freeze, I don’t want to be premature. I will have more information to follow in an article as the new season arrives and Wing Bug is ready to hit the market. 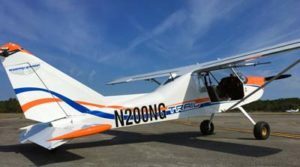 WingBug is being developed by Alex Rolinski, known to light aircraft enthusiasts for his role in a different company, Aero Adventures, maker of the reasonable priced Aventura seaplane kit. Wing Bug is a stand-alone device that can clamp securely to any Go-Pro mount. You’ll probably stick it out on a wing, away from influence by prop blast. It wirelessly (not via BlueTooth) sends air data, attitude, and heading info (ADAHRS) to the WingBug app on an iPhone or iPad. This is not simply a GPS gizmo or flight navigation app. For example, to provide airspeed, WingBug has its own pitot tube. It looks slick, can be used on certified aircraft, and may prove to be game changer. I’ll have more early next year.